There are plenty of folks who may disagree, but, among the pantheon of great Southern consumable liquids, surely sorghum syrup and whiskey are among the mightiest. Neither are exclusively Southern, far from it actually, but both have a storied history in our region and an inescapable connection to it still. According to the National Sweet Sorghum Producers & Processors Association (the NSSPPA to those in the know), the two U.S. states that lead our sorghum syrup production are Kentucky and Tennessee. And what do you think of when you think of Kentucky and Tennessee? Whiskey. Thank you very much. So when you come upon the surprisingly rare meeting of these two Southern stalwarts – sorghum and whiskey – it is cause for celebration, like a soiree out on the lawn on a moonlit Southern summer night toasting the union of two lovely souls. Let’s back up, though, and take a longer look at sorghum, which is surely the lesser known partner in this pleasure-powering duo. If you’ve ever driven through rural Tennessee in late summertime, there’s a good chance you’ve seen sorghum out in the fields. And there’s an equally good chance you thought you were looking at corn. Similar stalks, bright tropical green leaves, as high as an elephant’s eye. The sorghum stalks do produce a grain, again not dissimilar from corn (popped sorghum is a thing, and it easily gives popped corn a run for the money in the crunch and flavor department), but sorghum’s greatest gift to humanity is the syrup which comes from pressing those stalks and boiling down the juice. It was a staple on Southern tables in the first half of the 20th century, gracing biscuits daily, but fell out of favor as sugar prices fell and farm labor costs grew. Thankfully, sorghum syrup is seeing a recent rebirth in attention thanks to chefs like Sean Brock and Linton Hopkins around the region who are eager to fully embrace the region’s historic culinary riches. Despite the fact that sorghum syrup production is down to just 5% of what it was back in the early 1900’s, there are still a handful of sorghum syrup artisans out there making products every bit as delightful as the finest Vermont maple syrup or Tupelo honey. The jug I happen to have on my counter was purchased at Atlanta’s Star Provisions, and comes from Muddy Pond, a Mennonite farm in Tennessee. Mark Guenther and his family have been working their soil since the mid-1960’s, and continue to win raves for their outstanding sorghum syrup. Imagine taking the best qualities of a floral honey, a rich molasses, and a deep maple syrup and you’ll conjure up something like Muddy Pond’s sorghum syrup. While we’re on the topic, to get a better feel for Guenther and his family sorghum farm, please go watch this short from the Southern Foodways Alliance – it’s a far more immersive introduction to sorghum than what these words will provide. Now, as we turn our attention from sorghum to whiskey, let’s first think about sorghum as it relates to the world of spirits. Of course, sorghum can be used to replace sugar in cocktails (check out this fine concoction from H. Harper Station’s Jerry Slater, shared over on the Bitter Southerner), but it’s little stretch of the imagination to see that sorghum syrup could also be used in a manner similar to molasses – which is to say, as the basis for rum. 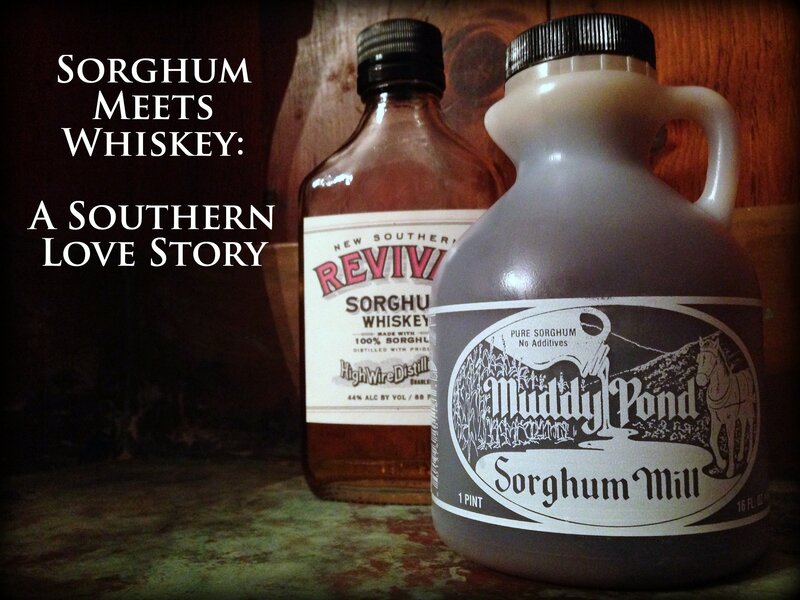 Simply put, sorghum syrup has the sugar necessary to convert to alcohol, and the flavor to make it delicious alcohol. But – you may ask – how do we get from rum back to whiskey, which was the whole point of all this? Well, there’s a bit of semantics here. Rum, by legal definition, must be made from sugar cane. A sorghum-based spirit simply can not legally be called rum. 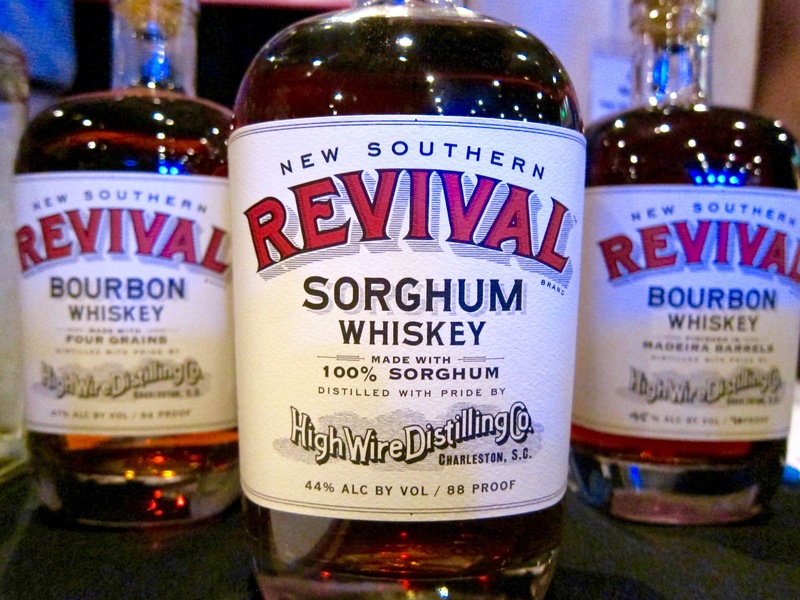 So a spirit made from sorghum must be whiskey, right? Well, the U.S. government says that whiskey must be made from “a fermented mash of grain.” Sorghum does indeed produce a grain, but most of the few sorghum whiskeys on the market in the U.S. (and there are a couple) are made from sorghum syrup (from the cane), not the grain itself. (Side note: check out more geekery on this topic over on Chuck Cowdery’s blog – and also note that the Chinese have a very popular spirit called baijiu which is actually made from fermented sorghum grain and is reportedly the most-consumed spirit in the world!). But what if the sorghum grain were mashed up alongside the cane to produce the juice that gets boiled down to make the sorghum syrup? Turn’s out, that’s exactly what the good folks at Muddy Pond do out in their sorghum fields. In Charleston, High Wire Distilling Company has been turning heads since its opening in 2013 with some distinctly Southern spirits. They’ve crafted a watermelon brandy from the juice of 273 heirloom Bradford watermelons from a nearby farm. They’ve also turned fresh-pressed local sugar cane into a purely Carolina take on Caribbean rhum agricole. Owner and head distiller Scott Blackwell seems to always be on the hunt for compelling ingredients to serve as the basis for his spirits, and he struck a small bit of Southern gold when he teamed up with Muddy Pond, the Tennessee farm mentioned above, to source sorghum syrup for his New Southern Revival sorghum whiskey. I chatted with Ann Marshall, Blackwell’s wife and partner in High Wire, at a recent trade show to get the lowdown on their sorghum whiskey. Their sole supplier is Muddy Pond, and Marshall notes that “their sorghum syrup is the most unique we have ever encountered, and we have been unable to source anything else quite like it.” High Wire has been buying Muddy Pond’s sorghum by the drum, and has already discovered that there’s not quite enough available to get them through the year. The sorghum harvest comes each September and October, so by the following summer, it’s just about gone. High Wire’s current releases of sorghum whiskey came from last year’s crop, and the whiskey sees four to six months in 15 gallon barrels to provide a bit of aging and character from the wood. High Wire’s sorghum whiskey tastes like a far older spirit than a mere six month old. More interestingly, it somehow manages to tingle tastebuds with colliding but harmonious notes reminiscent of three other spirits you might be more familiar with – rum, bourbon whiskey, and rhum agricole – each emerging for moments of solo clarity before falling back into the chorus. The rum-like butterscotch tends to hold sway, but grassy notes reminiscent of a good rhum agricole come through, and then whiffs of vanilla and oak that will have you thinking bourbon again. If you tasted it blind, you might have a hard time placing it, but once you know what it is, picking out the distinctly-sorghum sweetness is easy, especially underpinning the long, warm finish. This sorghum whiskey makes for a lovely Manhattan or Old Fashioned, but the sorghum character is better appreciated sipping neat or with a cube of ice. The biggest problem I have with High Wire’s sorghum whiskey is that there’s so little of it to be found. That said, High Wire does distribute all around their home state of South Carolina, and their products can be found (if you’re lucky) in Atlanta, Savannah, Washington D.C., and New York as well. If you can find it, grab a bottle. Better yet, grab that bottle, some Muddy Pond sorghum, then whip up a batch of biscuits for a bunch of friends and family. There’s a whole lot of Southern love to be found in that little party. Full Disclosure: Tasting sample provided by High Wire Distilling Company. it’s not whiskey because it’s using a non-grain adjunct (the syrup). It’s a distilled spirit specialty. This doesn’t change whether or not it’s good, just whether or not it is honest marketing. Noah, my understanding is that the grain of the sorghum is included in the pressing which goes into the mash. it’s certainly not pure grain as in barley/rye/corn, but apparently it meets a minimum level to qualify as grain-based. On your article I believe it says that grain is used alongside the juice. I interpreted that to mean the juice is used, to any degree, in the production. Whiskey has to be made entirely from grain. Please reference TTB type and class designation if you would like further information on the topic. The TTB has been explicitly clear on this topic. however, they are not farmers and the confusion that sorghum grain (top 5 world Ag commodity) and sweet sorghum juice persists. Can you ship to CA?